Advice: When you are looking for that first break, understand that the first few months will be rough and your first job probably won’t be your preferred job. Work hard, prove your worth, and keep networking. Make one job lead to another. August 2006 - When Hilary Carr graduated from Meredith Manor and returned to Iowa, things didn’t go exactly as she’d planned. Horse operations were gearing down in preparation for the slower winter season ahead. Adding new employees wasn’t in their short-term game plans. Hilary found herself self-employed, taking whatever odd jobs she could find. She did some horse massage, filled in as a substitute teacher at Greenbriar Riding Academy where she rode before she went to Meredith Manor, and worked to put some polish on two horses at El Ranchero de Cabellos, a nearby boarding stable. Her first break came when a student in one of her riding lessons at Greenbriar got a new horse, boarded it at El Ranchero de Cabellos and asked Hilary to help her get used to the new mount. The second came when the Greenbriar (where both the owner and head instructor are Meredith Manor graduates) offered Hilary a job cleaning stalls through the winter and she took it. “It wasn’t my dream job,” she says. “I took it because I needed the money.” She worked from 6 a.m. until noon and handled both morning and noon feedings. The diligent way Hilary handled her not-a-dream-job was noticed, however. When the Greenbriar’s summer camp needed another camp instructor, she was hired. Her career continued to build momentum when a few riders asked Hilary for help with their horses. Then the owner of the local tack shop asked her if she would like to be introduced to a friend who needed a rider for her horses. That introduction took Hilary to Gypsy Lane Farms owned by Norma Arisos where the emphasis is on dressage. The 13 horses living at Gypsy Lane Farms range from retirees to an FEI-level Thoroughbred/Clydesdale cross. Four of them are big, colorful Gypsy Vanners. Hilary took some of the horses to local shows this year, her first competitions. Although she admits to having nerves, she placed well in her first one-day horse trial (dressage, cross country, and stadium jumping) on Fox, a young quarter horse. 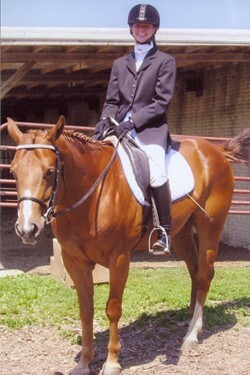 At a local dressage show, Fox placed third in Training Level Test 4 and fourth in First Level Test 1. 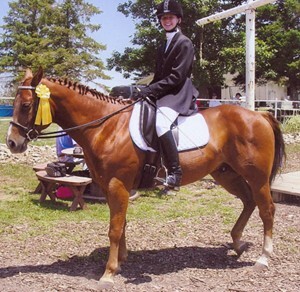 Norma placed fourth in Introductory A on a Gypsy Vanner named Bob that Hilary had worked with. Next year they plan to go to rated shows with Beaudacious, Norma’s FEI-level horse. Hilary says her greatest sense of accomplishment working with horses to date comes from creating relationships with them. She savors the moment she lets a horse go free in an arena and that horse chooses to come back and stay with her. She comments that one 3-year-old she currently works with started out with a tough attitude that he could care less about people. Now he loves hanging out with her. A new Gypsy Vanner colt born on Father’s Day will be a new training project as he matures. Hilary appreciates the many different options she learned at Meredith Manor for dealing with individual horses and teaching situations. “My boss thinks I’m brilliant because I have five different ways to get to the same end,” Hilary says. She still goes back to her Meredith Manor theory notebooks and journals for ideas on training and riding exercises that will fix things that are going wrong. She also appreciates that while learning how to teach the progression of skills to be mastered in the riding tree she learned how to talk to people, why they may act the way they do, and how to evaluate what a rider is doing by watching what the horse is doing. If anything has surprised her, Hilary says, it is the number of people who own horses but don’t understand them at all. 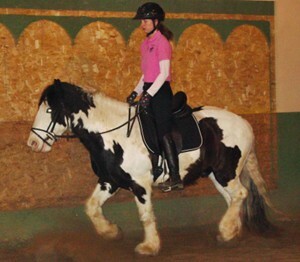 She has gotten many calls from people who have never owned a horse but bought one on impulse. “People get involved with horses without knowing anything about them,” she says. “They don’t understand that it’s a little more serious than buying a dog.” Fortunately, they can turn to instructors like Hilary to help them learn how to enjoy horses as much as she does.